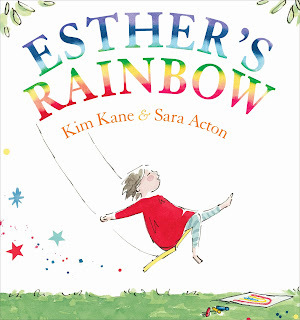 One Sunday, as she's eating lunch, Esther catches sight of a rainbow poking out from under her stool. She examines it closely and discovers that her rainbow feels soft, smells a little like honey and hums a secret hum. But then her rainbow … vanishes! Esther spends the rest of the week trying to find it again. On Monday she finds violet — in a bruise, on a kitchen blackboard, in the taste of Granny's chocolate creams. On Tuesday, she sees indigo — in a wonky hat, in a forgotten feather and in the smell of a midnight sky. On Wednesday, her brother's 'swim-cold lips' reveal the colour blue. Thursday is green day, in fishpond slime and the smell of mint. Friday brings her yellow, on the buttery chin of a baby and in the taste of a pear warm from the tree. Saturday has orange in her morning juice, on the bill of a duck and between Esther's fingers as they mould clay. Sunday is the red of raspberry ice, the ruby-seeds of a pomegranate, and the perfume of Granny's roses. But there's no rainbow … until Monday comes round again and rain showers fall. And then, in the corner of a mirror, Esther spies a new rainbow to 'sing her own'! Esther's Rainbow is everything a picture book should be. Kim Kane's skilful use of language creates an absolute feast for the senses: this is a book that encourages children to truly engage with the world around them, to not only see colour, but taste it, smell it, feel it. And Sara Acton's illustrations are the perfect accompaniment, adding further depth to this beautiful book. A delightful story brought brilliantly to life by an award-winning author and illustrator, Esther's Rainbow is one book I know my daughter and I will be reading again and again!